As Northwestern University embarks on an ambitious plan to transform the nature of Computer Science and its impact on other fields, it has established the Computer Science + X (CS+X) initiative. With this initiative, the University recognizes that computers and computational thinking are changing everything, including the way we work, play, think, shop, and plan. And Northwestern wants to help lead that change. Within the CS+X initiative, we are working to actively discover and support transformational relationships among computer science and other fields. By connecting CS with diverse disciplines, we can drive transformational connections across the University and potentially spark entirely new fields of study. The explosion of available data combined with increased computing power has led to a research boom in artificial intelligence and machine learning, robotics, data analytics, and more. But this is just the beginning. CS has the power to alter the way researchers think and foster new collaborations among diverse academic communities. To date, Northwestern has advanced CS+X work in areas as diverse as education, journalism, law, music, and the social sciences. We also have plans in action to cross boundaries into the performing arts, medicine, and economics. Ultimately, we will establish connections across the entire fabric of the University. Northwestern is aggressively supporting the CS+X initiative in an effort to expand the impact of Computer Science into all aspects of University research and education. These efforts include new joint faculty positions, research, and a new approach to CS education, with the goal of transforming the very nature of how research and work is done. Computation + Journalism Symposium 2017: This conference brings together journalists and technologists, academics and practitioners alike, to share research and explore the ways that computation is transforming all the key functions of journalism: reporting, analysis, verification, storytelling, publishing, distribution, and audience engagement. Bridges II: The Law-STEM Alliance & Next Generation Innovation Conference: This conference will explore the role of law, business, policy, and regulation in the innovation process, and the role of scientists, engineers, and entrepreneurs in the process of law and policy-making. CS+X Colloquium Series: This colloquium series seeks to define the challenges and opportunities for both computer science and other disciplines as the scope and nature of computational thinking continue to evolve. Knight Lab Studio: Knight Lab Studio is an interdisciplinary class where students, faculty, and professional staff work together at the intersection of storytelling, design, and technology to produce cutting-edge digital work, research, and thought — innovating across every part of the media-making process. Along with academic work, the CS+X initiative is launching a development organization that will take promising ideas and move them into robust software prototypes. We take this innovative approach because we understand that the impact of ideas can be amplified through execution and that software is often more powerful than a conversation. To learn more about any of these activities, please email the CS+X team. We are open to ideas and suggestions of additional activities from all across the University. For more information about the future of Computer Science at Northwestern, please email CS+X. 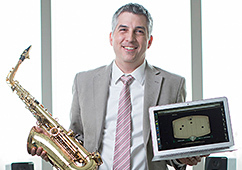 An accomplished jazz musician, Bryan Pardo uses computer science to develop easy-to-understand tools for audio production. His tools include SocialEQ, an equalizer that lets the user achieve a desired effect by listening to the sound and rating alternatives. Oliver Cossairt uses computer imaging to uncover the hidden layers in works of art. 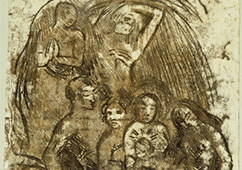 In partnership with the Art Institute of Chicago, he helped reveal how Gauguin created his Nativity print: a layering of images created on paper by drawings, transfer of images, and two different inks. Working with the Rehabilitation Institute of Chicago, Brenna Argall combines computer science with robotics to develop devices for individuals with physical disabilities. Her work includes an autonomous wheelchair that uses technology similar to that in driverless cars. Douglas Downey worked with English and classics professor Martin Mueller to restore millions of incomplete words in transcriptions of early English texts. 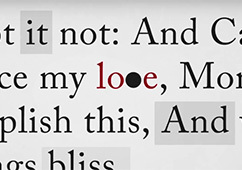 The team used machine-learning techniques to evaluate the contexts of the incomplete words and fill in the missing characters.